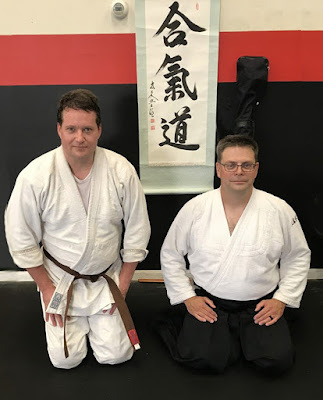 Aikido is currently the martial art of choice among police forces nationwide because of its emphasis on controlling an attacker rather than intentionally causing injury. See the Aikido Tab for more details. Aikido can be practiced by anyone in reasonable health, regardless of athletic ability or previous experience. 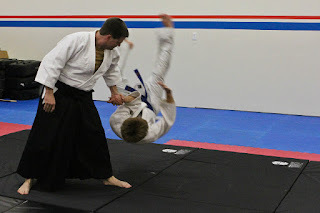 Since Aikido techniques do not require great physical strength, men and women of all ages can practice together. There are adult and child classes (see class information (link)). Mushin Martial Arts is dedicated to helping anyone who wishes to learn this dynamic martial art. Contact the chief instructor and let him know when you want to begin (see contact and class info on About Dojo tab). All you need is a pair of sweat pants and sturdy or old T-shirt. A standard white Judo type gi is the all the uniform you need if you decide Aikido is right for you. Are Size & Strength Important? No. Aikido uses circular and angular movement to redirect and neutralize aggressive energy via the use of joint locks nerve locks, pins and powerful throws that do not rely on size or strength. Will I Learn How to Use Weapons? Yes. 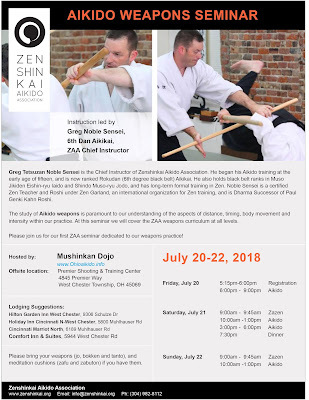 The bokken (wooden sword), Jo (short staff), and tanto (dagger) are part of the ZAA curriculum. You will learn how to properly use and defend against these weapons both against each other and empty handed. Aikdo was derived from sword techniques. Aikido terminology is based in Japanese. For instance, the exercises, techniques, and counting are often spoke with Japanese words. See the document called Basic Terminology to help translate these.